To successfully infect resting immune cells, Human Immunodeficiency Virus (HIV) must overcome several hurdles. An international research team has identified a new restriction mechanism, which may have implications for therapy. If left untreated, HIV infection inevitably leads to AIDS, a life-threatening acquired immunodeficiency syndrome, which essentially disables the immune system. 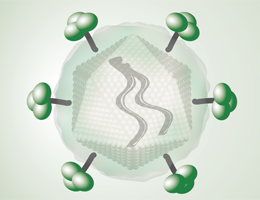 HIV is an RNA retrovirus, and antiretroviral therapy (ART) now makes it possible for AIDS patients to control proliferation of the virus sufficiently to keep the numbers of viral particles in the bloodstream below the limits of detection. However, it is not possible to cure the disease, because the virus can persist in resting immune cells. These cells are not accessible to current treatment regimes, and thus form a reservoir from which the virus can re-emerge upon cessation of ART. Resting CD4+ T-cells are largely refractory to HIV because they express so-called restriction factors that limit replication. However, the virus does manage to establish itself in a small fraction of such cells, which can account for the rise in the numbers of circulating virus observed when ART is discontinued. Virologists led by Professor Oliver Keppler of LMU‘s Max von Pettenkofer-Institute and Professor Oliver Fackler at Heidelberg University Hospital have been studying how HIV manages to circumvent the restriction on its replication in resting immune cells. Their latest investigation has uncovered a host-cell defense mechanism that differs from other known cellular barriers to HIV infection. The new findings have been published in the journal PNAS. When Keppler and his colleagues set out to probe the effects of Vpx proteins from SIVs on the susceptibility of resting CD4+ T-cells to HIV infection, they made a surprising discovery: Although Vpx proteins encoded by SIVs isolated from less well-studied monkey species failed to trigger degradation of human SAMHD1, they nevertheless boosted the rate of infection of resting CD4+ T lymphocytes by HIV-1. “These results suggest that, in addition to SAMHD1, there is a second host factor that restricts HIV proliferation in resting cells, which is inhibited by these specialized Vpx proteins,” Keppler says. “Interestingly, this second mechanism also blocks reverse transcription of the viral RNA into DNA. But it must act in a fundamentally different fashion because, unlike SAMHD1-degrading Vpx proteins, it has no effect on the levels of dNTPs present in cells. For this reason, the researchers believe that it may be an even more important restriction factor in resting T-cells than SAMHD1.